The small village of Pisogno has as its flagship, in addition to Piazza San Carlo – recently embellished by the new flooring and with the statue of the saint in the center – the parish church dedicated to San Gottardo. Built in Baroque style in the 16th century, it was at the time a simple chapel that was completely transformed in the following century on a project by the architect Andrea Biffi. The fresco on the choir wall, representing a “gallery of saints”, due to Fermo Stella da Caravaggio, is of considerable value. Fascinating the church of the Crucifix to the “Castle” that can be reached through a staircase flanked by a Via Crucis of the ‘700. 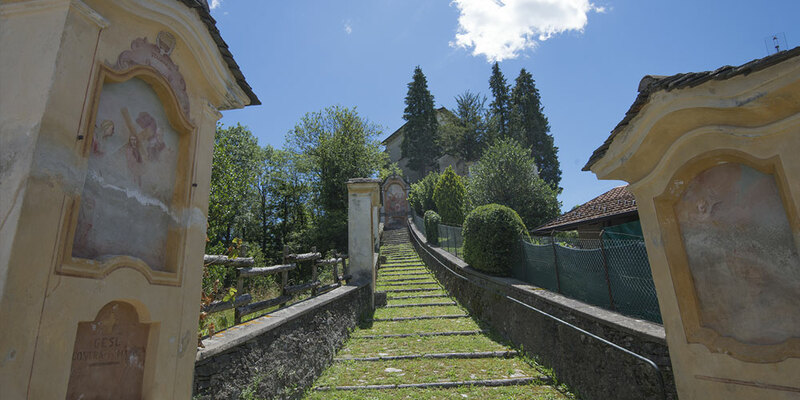 The small church dominates Pisogno and with the jubilee year reorganized an ancient tradition: every 25 years, the day before the feast of the Exaltation of the Cross (in September), the parishioners carry the statue of the Crucifix in procession to the parish church of San Gottardo, to bring her back to the castle solemnly the following day. Previously the traditional translation happened every 50 years. Every 5 years, however, same procedure for the statue of Our Lady of Sorrows, whose feast falls on the following day that of the Exaltation of the Cross.